Brief Overview: Developed by experts at the National Center on Domestic Violence, Trauma & Mental Health, in collaboration with experts from the National Domestic Violence Hotline, the National Suicide Prevention Lifeline, and the University of Rochester Susan B. Anthony Center and Laboratory of Interpersonal Violence and Victimization, this document provides guidance for suicide prevention crisis centers on recognizing and responding to intimate partner violence (IPV) in the context of suicide prevention and other crisis calls. 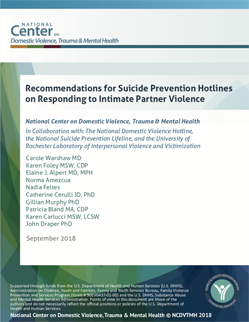 In addition to background information on the relationship between IPV and suicide, this document provides recommendations for suicide prevention hotlines on how to prepare their organizations to respond to IPV, and practical suggestions and tools for crisis line staff on screening, risk assessment, safety planning, and referral for callers who are experiencing IPV. Continuity of care (developing partnerships with community domestic violence (DV) programs and hotlines, linking to DV resources).